Most of us tend to go through our mail as we stand over or next to the trash. With so many offers from so many different companies we neither know of or care about, the amount of junk mail can be a little overwhelming and bothersome. So what do you do to reach your potential customers at home when your postcard and brochure efforts aren’t reaping any results? Turn to door hangers! More often than not, the reason mailed brochures, letters and pamphlets don’t work is because they simply offer too much information to the customer. It’s important to keep in mind that when you’re mailing to prospects that know very little about your product, you want to avoid bombarding them with information. Highlight the top 3-4 features and/or benefits of your product or service on your custom door hanger, and keep the rest in your pocket so you have more to work with when you get a phone call. 2. Take Time to Design! Don’t rush to get a messy product plastered to your customers’ doors. When your communications arrive, you want them to be tasteful, well put together, vibrant and indicative of the kind of attention and detail you put into helping your customers. Choosing verbiage that your prospects relate to is incredibly important, as is selecting images that appropriately complement your text. It’s better to delay a deadline and send out a more effective product than it is to have your hurried efforts result in a lackluster door hanger that just winds up in the trash. 3. Include a Call to Action! Attaching a business card or tear-off coupon to the bottom of a door hanger is a perfect way to heighten interest and open channels of two-way communication. Just like your email campaigns and postcards include a call to action, your door hangers should also. Tell your customers what you want them to do, and provide a simple way for them to do it. 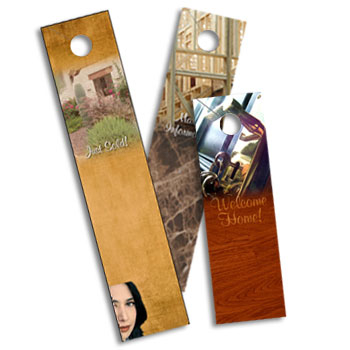 Door hangers should be considered as one part of a multiple touchpoint, direct marketing campaign. Delivering and abandoning them will result in far less interest than a delivery that’s followed up with another touchpoint. Just like you wouldn’t call a potential customer just once, you wouldn’t want to leave your customers with just a door hanger. Consider following up with a more detailed brochure, pamphlet or email campaign. As a business, you have many different marketing tools at your disposal, but it’s important to remember that the ways in which they’re put together are much more important than how many options you have access to. Something as simple as a door hanger, when implemented the right way, can be just the thing your direct marketing campaign needs to succeed!